While traveling I finished Dean Karnazes' Ultramarathon Man. I loved this book and read it very quickly, though I felt it was ironic that I was mostly sitting cramped in a plane while reading it. He is a guy who has done more unbelievable races than anyone I've ever heard of (such as a marathon at the South Pole, with running shoes instead of snow shoes). The book concludes with a run he did for charity, a 199 mile relay race in northern CA. But instead of a relay, he did it solo, running all 199 miles nonstop in just under 48 hours. Even more insane was that his last mile was under 6 minutes. I ran my first marathon last year, and will do more, which was pushing the envelope for me, and it is fun to read about how far other people are able to push it. I'm off to Seattle, where Amy's family lives, so blogging will likely be lighter. Via Borderline. Funny, but true when you think about it. Following up from yesterday: the candidate favoring the Senate immigration plan defeated his enforcement-only opponent in yesterday's Utah primary, 56-44. If nothing else, it clearly throws a wrench into the ubiquitous "will of the people" argument being thrown around. I would never have thought I would be interested in a Utah congressional primary involving two bland conservative Republicans, but here I am. They differ only on immigration, and so will affect the way in which Republicans deal with the issue. Tad Walch, a reporter with the Deseret Morning News in Provo, said the race has generated "a lot of interest nationally." President Bush and first lady Laura Bush recorded automated phone calls sent to voters across the district to try and drum up support for Cannon in what is expected to be a low-turnout contest. On the other side, the Team America Political Action Committee dropped $50,000 into an ad played widely on talk radio blasting Cannon's immigration record: "A vote for John Jacob is a vote for cleaning up the immigration mess Chris Cannon helped make." In this case, the primary winner will be elected, because Democrats just don’t win in that district. However, it could be a test case for how Republicans feel they should address swing congressional districts where immigration may be relevant. These two candidates look almost identical, so I believe I am rooting for the guy with a little more hair (see photo in the article). There is an excellent analysis at Plan Colombia and Beyond about the UN’s new numbers on Colombian coca, which show (as do U.S. government numbers) that coca cultivation is increasing. It underlines the failure of a policy based on eradication. After years of such an effort, coca planters have simply become smarter, moving around and returning once the government (i.e. troops) has left. The main argument is that without a significant rural development program, there is no way to stop people from growing coca. It should also be mentioned, though, that as long as Americans take large amounts of cocaine, supply will do its best to satisfy demand. The Senate has voted to eliminate the punishment of military aid denial for countries that ratify the ICC but don’t provide waivers for U.S. citizens. It would still allow cuts of USAID money. General Brantz Craddock, the head of SouthCom, has led a campaign to end the cuts. The House has not agreed to eliminate it entirely, so we’ll see what happens when negotiations take place next week. Punishing countries in this manner is ham handed and ultimately counter-productive. Our Ambassador to the UN, John Bolton, still supports the policy. On Saturday we had a problem with our new air conditioning unit, which made for a hot evening (fortunately it was easily fixed). Now I arrive on campus for class, and find that a weekend power outage has made my building an oven. It is a warm and humid morning, so my office is not a particularly pleasant place to be. 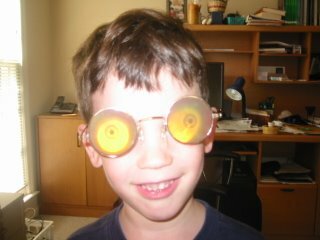 My son found these glasses somewhere. Bizarre story from the AP (via the Miami Herald) about the “proof” that the U.S. is going to invade Bolivia by introducing soldiers disguised as students. The Bolivian government sent a six page document to news organizations, which is characterized as “amateurishly written” and “often incoherent.” They don’t provide a link, so I’d like to see it myself. The sad thing is that the U.S. has conducted enough ludicrous covert operations that any world leader will think such a thing is possible. --60% said they would likely vote for a candidate supporting a comprehensive plan; only 46% said they would likely vote for a candidate supporting a House-type plan. --Only 23% said that what Congress does between now and November on immigration would influence their votes. I know I am a broken record on this topic, but Borderline has a good discussion of the use of polling to determine what Americans think about Latino immigration. The Republican leadership has used polls to try and convince Bush (and others who like the Senate bill) that Americans want enforcement only. The bottom line is that wording of the questions means everything. ``Evo Morales and his Movement Toward Socialism Party have continued to waver on economic policy, democracy and counternarcotics. ''The new Bolivian government has, on several occasions, demonstrated inclinations to consolidate executive power and promote potentially antidemocratic reforms through the Constituent Assembly and other means,'' Franco said, referring to a July 2 vote that will elect representatives to rewrite Bolivia's constitution. Speaking to coca growers Sunday, Morales used a phrase in the native Quechua language that he said may have irritated the U.S. ambassador. "I shouted, 'Qausachun coca (Long live coca! ), wanuchun yanquis (die Yankees! ),'" Morales said Tuesday. "If he complains, I, too, have the right to complain." Johnny believes illegal immigration is the number one domestic issue facing the United State and that we cannot wait any longer to address it. He also believes that the best way to address this crisis is by making the commitment to secure and seal the border first, before dealing with the problem of how to handle the millions of illegal immigrants who are already here. Now, Johnny, given that illegal immigration centers on supply and demand, do you believe the market or the government should control things? The Padres are in sole possession of first place, which is a nice feeling, but we’ve got some weird numbers. We have a losing record at home (the Padres hope that new hitting coach Merv Rettenmund can better attune hitters to Petco Park). We have the lowest scoring percentage of any first place team (welcome to the NL West). We have scored the third fewest runs in the majors, ahead only of the Cubs and the hapless Royals. However, we have given up the second fewest runs, behind only the juggernaut Tigers. I don’t know what this portends, but for now, “small ball” is working. It looks like immigration reform is dead for the foreseeable future, which really should come as no surprise. Instead, there will be some “field hearings” in the fall, conducted in the Southwest and South, where Republicans hope that restrictionist sentiment will boost their November chances. These will likely be political circuses, and painful to watch. The Republicans are banking on the idea that the “will of the people” is enforcement only. As I’ve said many times, there is scant evidence for that. On the other hand, maybe they just have their eyes on specific congressional districts where they think the issue may swing the election. Via The Latinamericanist (no connection to the journal) – Hugo Chávez often refers to Bush as “Mr. Danger” and it turns out it is a literary allusion to a classic 1929 Venezuelan novel that includes a lazy foreigner who refers to himself as Mr. Danger. Apparently this was pointed out by Greg Grandin, whose books Empire’s Workshop and The Last Colonial Massacre are two I’ve been meaning to buy and read. There are a lot of books in that category. Academic Coach talks about the importance of finishing when doing academic work (or maybe any work, for that matter). I didn’t agree with her last advice, but this makes good sense. Having a large number of unfinished tasks can be a downer. I would add that it is also important to start. I find this particularly true of articles that have already been rejected at one journal and need work for submission elsewhere. One of the hardest things is wading through all the comments (which, because it was rejected, are not likely to be fun reading) and making the necessary changes. I’ve got one such article on my desk, and it’s been waiting patiently for my attention for a while. The NYT has a good report on the continued investigation into Augusto Pinochet’s efforts to enrich himself illegally (to the tune of at least $28 million) while in power, which includes having people killed—even after the transition--if they appeared to be on the verge of talking. The crumbling of Pinochet’s image has been remarkable. He had portrayed himself as different, a heroic Cincinnatus figure who could not be compared to corrupt dictators elsewhere. Now it’s clear that he can’t even pretend to make that claim. Not only was he brutal, which everyone already knew, but he was a two-bit thief as well. The right has long since distanced itself from him. From the AP: the Morales administration says it wants to negotiate a free trade agreement with the United States. Tough to say whether it will ever actually happen, but it does underline how problematic labels are, and how proclaiming Morales a clone of Hugo Chávez misses the mark. "If Evo Morales negotiates a free trade agreement before and perhaps ... the constituent assembly takes another position, any negotiating will have been useless," Morales said. Who tends to do so, and why? Greg would like to know. His fiery appeals have turned the election into a referendum on whether the country wants to stick with the free trade and pro-business policies of the Fox administration or join the growing number of Latin American countries — Venezuela, Bolivia and Peru among them — that have elected populist left-wingers who want to assert greater state control over the economy and funnel more wealth to the poor. Just the term “left-winger” sounds so antiquated. But he writes that Venezuela and Peru elected the same type of president, when in fact Chávez actively and openly campaigned against García. But the general description of AMLO is far more positive than the last NYT article. Couldn't resist this story. In Colombia, distraction is the leading cause of car accidents. The second leading cause of distraction is staring at women, according to the director of an organization that did a study on this important matter. His presentation included close-up images of attractive women in miniskirts to remind the audience of the extent of this danger. Very dangerous. But what to do? While authorities have begun fining those caught driving and speaking on a cell phone - sanctioning more than 17,000 drivers in Bogota alone last year - the fund is recommending less draconian methods to discourage men from looking at women while driving. "We are hoping for an educational campaign, to inform drivers of how dangerous this can be," said Fernandez. Other listed distractions were drivers fussing with their appearances and looking at advertising - which in Colombia often features scantily clad women. I finally finished up a grant proposal I've been working on for some time, and it's very nice to get it out of my hair. But now I have to wait about four months to see what happens. The Miami Herald notes a speech made by Raúl Castro on Wednesday. The full text (in Spanish) is at Cuba’s state newspaper Granma. The article emphasizes that Raúl made a point of saying that ''Only the Communist Party -- as the institution that brings together the revolutionary vanguard and will always guarantee the unity of Cubans -- can be the worthy heir of the trust deposited by the people in their leader.” In other words, when Fidel dies, the Communist Party assure a smooth transition of power. I would think this will cause speculation—why make this point? There have always been rumors about Fidel’s health, with the most recent being that he has Parkinson’s, but nobody knows. I think this will fuel even more. No sería la primera vez que una potencia imperialista, y en particular los Estados Unidos, acude a la guerra como vía para intentar la salida de una crisis interna de cualquier tipo. I hesitate to address Lou Dobbs, because he is a ridiculous blowhard. But when you have a scare monger with a high media profile who makes things up to frighten people, then I can’t help saying something. He just published this article about the congressional debate on immigration reform. He states that “The Congressional Budget Office has just released its own analysis of the legislation, and it concludes that nothing in the Senate bill will end the overwhelming torrent of illegal immigration.” This is not true. That report says “CBO projects that the current undocumented population would shrink over time as emigration occurs and as some individuals become LPR [legal permanent residents]” (p. 43 of the PDF file). He also makes the point (over and over) that a restrictionist policy is the “will of the people,” sanctimoniously quoting Thomas Jefferson. So what is the will of the people? Is there even any such thing? As I have written before (here, here, and here), polls generally show that Americans tend not to be up in arms about immigration, no matter what pundits say. The WSJ and NBC News just released a new poll, where 50 percent of Americans prefer the Senate version of immigration reform (less fence and guest workers), while 33 percent favor the House version (more fence and deportations). Just less than half (49 percent) would be very or somewhat upset if no immigration bill is passed this year. So what do you do when your “will of the people” argument is consistently contradicted? You conduct your own poll to suit your purposes. He asked such questions as whether you think the number of illegal immigrants should increase, decrease or stay the same. Since 67 percent thought it should decrease, he comes to the conclusion that it is the will of the people to support the House bill. Look, this is an important issue, and many people do feel passionately about it. It deserves real debate. But if we disagree, let’s do so without being stupid. Last year I participated in the Fitzgibbon Survey, which asks people who study Latin America to rate democracy in different countries according to fifteen separate criteria (civilian supremacy, education level, free press, those sorts of things). It dates back to 1945, and has been conducted every five years since then. The results are now available. Overall, Costa Rica was deemed the strongest, and Haiti the weakest (no surprise there). Haiti was the worst in every category but two—Cuba was considered worst for freedom of press and free elections (though fairly high for education level and social legislation). From VivirLatino, news of the effort to get out the vote in Mexico for the July 2 election. Vote or shut up. Catchy. Also interesting is that the major sponsors of the initiative are huge U.S. corporations. Peru could support Venezuela's bid for a seat on the U.N. Security Council, Peru's President-elect Alan García said Tuesday as he toned down a feud with Venezuela. This comes just after reports in the Chilean press that Bachelet would vote against Venezuela, using the Peruvian opposition as cover to avoid making it look like she was bowing to U.S. demands. So where does this leave Bachelet? At the Arizona-Mexico border, fewer immigrants have tried to cross illegally since the arrival of U.S. National Guard troops. The main reason, however, is not one we should be proud of—people are afraid of U.S. troops because of the widespread reports of abuse in Iraq. At the same time, there has been more movement along the California-Mexico border, even though the Governator also has approved the use of the National Guard (though I do not know if they have been deployed yet). Although I am sure this will be heartening for restrictionists, chances are very high that it is temporary. The Guard will be eventually replaced by Border Patrol, at which point it is likely we’ll go back to the pattern of increased Border Patrol, fewer detentions, and more immigrants. It is also likely that, reports of abuse or not, word will spread that the Guard has no power to do much of anything but patrol. In today’s Charlotte Observer, Washington correspondent Tim Funk points out some hypocrisy. Two Senators in the Carolinas—Jim DeMint (R-SC) and Richard Burr (R-NC)—voted for the amendment making English the national language, but they also have links on their websites to translate everything into Spanish. The amendment says that no federal services or materials would be required in any language but English. "While he is very supportive of making English our official language, he understands some South Carolinian citizens and legal immigrants still speak Spanish as a first language and is happy to provide them with needed help while encouraging them to master English." If that is the case, then why would he vote for an amendment that expressly forbids them from that help? This language issue is absurd, based so much on fear, and stoked up by people like Samuel Huntington (as with his book Who Are We?) who believe that Latino immigration is destroying the country. I just finished reading Redcoats and Rebels: The American Revolution Through British Eyes, which my brother had recommended to me some time ago. I enjoyed the book, even though I am not big into details of battles (number of casualties, who hit what flank, etc.). But what sets the book apart is its focus on how the British were viewing the rebels, which was mostly with distaste, but with growing respect for their military abilities. The British had been sure they’d quickly beat these uneducated rednecks, and thought George Washington was a joke. A central theme is that British General Henry Clinton was ineffectual, timid, and indecisive, and he missed many opportunities to push the British advantage. He also strongly emphasizes the importance of the French intervention in bringing victory for the rebels. Civilian defense councils dug a tunnel inspired by Vietcong fighters to store food and arms. In one drill, troops showed reporters how they would store supplies in a cemetery and hid rifles among Virgin Mary statues during a religious festival. In another scenario, a lookout on a motorbike practiced warning a defense committee about an impending attack by delivering a message hidden inside a bag of bananas. Others got a coded signal from a stall selling fried cheese pasties. Delivering banana and cheese pasty messages after the U.S. invades Venezuela? I'm not even sure how to comment on that. Politicians come up with stupid stuff, but here's a doozy. Texas Governor Rick Perry wants to put webcams on the border with Mexico. Concerned citizens can then call a hotline if they spot someone trying to cross. For some reason I can picture late night drunken calls from all over the country, "Dude, I swear I saw somebody in sector 2. Go check it out." From the FT – Not only is Bachelet under pressure from the Bush administration not to support Venezuela’s bid for a Security Council seat, but there is also the pending issue of granting a waiver (often called an Article 98 exemption) to U.S. citizens for the ICC. In the Chilean case, the punishment could include denial of pilot training for their new F-16s. The article does note something that has become more clear, namely that the U.S. military thinks these ICC-based punishments are a bad idea. It is hard to see Bachelet buckling under to that pressure, because it would greatly weaken her political standing domestically. I can't think of any way of providing the waiver without looking like a stooge of the Bush administration. Do more border agents matter? From the Dallas Morning News via ImmigrationProf Blog. A fundamental argument by those wanting to increase the size of the Border Patrol is that more agents will mean more arrests. Turns out that’s not the case. In 2000, the peak year for apprehensions, a Border Patrol force of 8,200 agents nabbed nearly 1.7 million illegal crossers. Four years later, with manpower up by 2,200 agents, arrests were down by more than half a million. In fact, the Border Patrol's nearly 1.2 million arrests in 2004 closely paralleled its record in 1987 -- when its force was one-third the size. There are so many facile assumptions about enforcement, and statistics like these demonstrate that simply throwing money into the Border Patrol is not a useful way to address illegal immigration. In a speech to Border Patrol trainees, President Bush said, “Americans expect us to secure the border. And so we’re going to double your size and we’ll get you technologies.” It just isn’t going to work that way. As we all know by now, al-Zarqawi is dead. Before anyone celebrates too much, however, it is useful to think of the parallel to Che Guevara. He was a foreign guerrilla trying to spread his political vision (though obviously it was quite different than al-Zarqawi’s—the key point is that it was antithetical to the U.S.) and was a major target of the U.S. government. With the help of the CIA, he was killed in Bolivia in 1967. He was not the most important target in Latin America (that was reserved for Fidel) but killing him was seen by the U.S. as a major victory in the “war on communism.” However, the problem was that killing him did not stop the growth of insurgencies—on the contrary, he became a martyr. Killing the individual did not change the reasons why he had become a revolutionary in the first place, so others took his place. It also occurs to me that there could be a parallel to Pablo Escobar, the famed drug cartel kingpin in Colombia. His death, though widely trumpeted, had no effect on the drug trade at all. Instead, the Medellin cartel broke up into smaller pieces, and cocaine flowed just as freely (or even more freely). Demand for cocaine remained high, so others took his place. So although I hope this leads to a reduction in violence, there is reason to doubt it. Update: at least the Bush administration seems to get this - "We can expect the terrorists and insurgents to carry on without him. We can expect the sectarian violence to continue." Regarding the U.S. pressure on Chile not to support Venezuela’s bid for the Security Council, it appears that the Peruvian election has helped to solve the problem. It seems the Bachelet administration will argue that since President-elect García has denounced Chávez, then Chile should not make a decision that goes against its neighbor. In the name of neighborly harmony, Bachelet saves face and can claim not to be influenced by the Bush administration. These comments are certainly critical, but hardly constitute a verbal assault. I just finished listening to Manhunt, by James L. Swanson--I put it on the list on the side of the blog. It is the story of the assassination of Abraham Lincoln and the twelve day search for John Wilkes Booth. Although the writing can veer toward the melodramatic, accentuated by the reader (Thomas Richard, the actor who was John Boy in The Waltons), including a bit about how the conspirators were meeting beyond the grave, it was a fascinating story, suspenseful even though we know the outcome. I came away with the impression that Booth could’ve escaped into the deep south, which was his goal—and what the government feared--but overconfidence and arrogance led him to go too slowly. Arrogance dominated him throughout. The point is to sit down, begin writing, and keep at it even when your rough draft feels jagged and ugly rather than merely bumpy. I think that would kill me if I did it every day. In Argentina, President Kirchner has been very active in pursuing military officers associated with the Dirty War. The NYT has an interesting article about military resentment. The concern is partly about retired officers going on trial. But there is also another dynamic of younger officers angry that everyone is seen as tainted because of events that took place decades ago, before they even entered the service. I think this latter issue is extremely important. Establishing civilian supremacy over the armed forces in Latin America requires—among many other things--a strong working relationship and mutual trust, both of which are normally absent. There is no threat of a coup, but if Kirchner (and his successors) are seen simply as punishers, then there can be long-term consequences, as generations of officers are socialized in an anti-civilian (and as Brian Loveman has put it so well, an “anti-political”) atmosphere. The better strategy is to punish those responsible for human rights abuses while making clear to everyone else that if you respect democracy, the government is willing and able to work with you to create a comprehensive and viable defense policy. The Cuban president's stature appears to be at its highest in at least 15 years, elevated by left-leaning Latin American presidents. Now, on to the quotes given to support this hypothesis. Thanks to my brother for pointing out this lengthy NYT article on López Obrador. It seems mostly intended to attack him. What interests me the most, however, is the use of the word “populist.” In short, if I were reviewing this article for an academic journal, I would recommend not publishing it. The title of the article is “The Populist at the Border” (he was mayor of Mexico City, which is a long way from the border, but let’s leave that aside for now). He defines “populism” as “a bitter disenchantment with the fruits of globalization and a rising hostility to what, in Latin America, is usually derided as neoliberalism.” He cites AMLO, Argentine President Kirchner, Evo Morales and Chávez as examples. He then immediately contradicts this by arguing that Kirchner, though a populist, focuses on local elites and not the U.S. push for global markets. Later, he does the same again by saying that AMLO has no animus toward the United States, won’t nationalize industries, and instead aims his criticism at Mexican business and politics. He even quotes Jorge Castañeda, who says explicitly that AMLO is not Chávez. So although the crux of his argument is that AMLO is a populist (and a dangerous one at that) he is admitting that AMLO does not in fact have the characteristics of a populist as he has defined it. According to the article itelf, he is running under the banner of a well-established party, no one believes he wants to tear down Mexican insitutions or nationalize major industries, and he has pledged a good relationship with the United States. Michelle has posted about other AMLO stories. Although AMLO may have his problems, I find it hard to believe he will be as horrible as the U.S. press suggests. One of the many things we like about our new house is its proximity to the greenway. Today was the Northeast Greenway 5K, and we didn’t even need the car to get to it. We hadn’t run a race since February, which is a long time—the spring semester was extremely busy, so we missed a lot of races. It was Amy’s turn to push the kids in the jogger stroller, so I was able to air it out and win my age division (this was another small race—I felt good about my 7:20 minute per mile pace, but I am in the middle of the pack in large races). She actually came in second in hers, despite pushing about 90 pounds of kids and stroller. My personal goal is to break under 7 minutes per mile for a 5K. I came close two years ago at the Race for the Cure. Interesting piece in La Tercera about President Bachelet's upcoming (June 8) visit to the White House, written by Ascanio Cavallo, one of Chile's most respected journalists (who has written great books on the Pinochet dictatorship and democratic transition). She is getting the star treatment, staying at Blair House and getting a working lunch with the president. The message, though, is that future star treatment will be based on how she deals with Chávez. In particular, the Bush administration wants to be sure she does not support Venezuela' s bid to be on the UN Security Council. The Chilean government is being reminded that although it opposed the invasion of Iraq, the U.S. still negotiated the free trade agreement, but that if it supports Venezuela in this case, the costs "serían altísimos." Note: La Tercera has started a unique format, where you see the newspaper page exactly as it is in the print version, and it takes up the entire screen. More than two-thirds of voters – and equally large numbers of Republicans – support creating a temporary worker program. Proposals to allow illegal immigrants who have been in the country for at least five years and meet other requirements (pay a fine, pay back taxes, learn English, and go to the back of the line) to apply for legal status garner wide support. Republicans are so very split on this issue. I have a feeling House members will dismiss this, but it comes back to a fundamental question that I've addressed more than once--what do Americans really think about Latin American immigration? Anyone who claims a simple answer is flat wrong. Juxtaposing news from two different blogs provides a sobering view: Boz notes that Caracas is now the most violent city in Latin America, while Camilo links to several stories about how Chávez is negotiating to manufacture Russian Kalashnikovs (AK-47s) in Venezuela.